Seductive in their papers and casings, hams and salamis always peer at me from my favorite butcher’s deli case, luring me with their heady fragrances of garlic and smoke. I have a not-so-hidden love of cured meats and it’s not unusual for me to come home with extra packages of proscuitto and Genoa salami tucked in my bag. As I stand looking at all the rolls stacked high, I conjure up images of meats wrapped in paper, trussed tightly and hanging from the rafters of some imaginary old-world artisan. My mouth always waters. Due to this fascination, I have dabbled on occasion with making old-world artisan-style cured meats at home, but have often set aside the recipes as time-heavy, technically intricate, or expensive. However, in light of Jenny’s post last week about foods you can stop buying and start making at home, I was inspired to try once again to create a recipe that would draw from the flavors of what I love about old-world meats but that would be easy to make on a regular basis. At first I thought I’d try coppa di testa, which makes use of every part of a pig’s head and leaves nothing to waste – the meat is tenderly braised and the pork bones are simmered to produce a gelatin-rich stock, then everything is pressed together and chilled to produce a nutrient-dense lunch meat fit for kings. Problem is, I don’t regularly have access to a pig’s head and if the whole point of this is to come up with a recipe that’s easy to make regularly, this one wouldn’t fit the bill. So, the pig’s head was out. Next I thought, why not try mortadella? It’s the real-food, old-world predecessor to bologna in which pork is ground to a paste with herbs and extra cubes of fat to make it smooth, then stuffed in casings and cured like salami. I was absolutely tempted, but finding casings regularly once again sounded like too much work to make it practical. So, I started experimenting, drawing on flavors and techniques I use regularly when making other similar dishes, such as my favorite French country-style pate and chicken and bacon roulades. I purposely only chose ingredients to which we regularly have access, and I substituted cheesecloth for the casings, just to keep it as simple as possible. And here’s another idea: If you want to make really easy sandwich meat, take a cue from roast beef – it’s literally that, a beef roast sliced thin. You can brine it first if you like, but that’s optional. Whether you use beef or pork, it’s a great way to use up leftover roast. If you’re game to try your hand at homemade charcuterie, take a look at the Art of Charcuterie which provides simple, practical recipes and steps as well as vivid step-by-step color photos of most of the foods. It also provides seasoning guides for classic sausages, and outlines safety measures that must be considered for the more elaborate, aged and cured salamis and meats. The Art of Charcuterie usually retails for $65 (it’s a massive book), but you can get it’s on sale right now for $39.81 (click here). This recipe calls for the use of gelatin to help solidify the lunch meat in the absence of using a pig’s head (often used for traditional charcuterie, but in short supply in most areas). You can find powdered gelatin at any grocery store; however, it is typically produced from pigs held in confinement operations which are deeply and fundamentally damaging to the local environment. Instead, consider purchasing a good quality grass-fed beef gelatin which can be found by mail order and online (see sources). Make your own lunch meat with this easy recipe featuring bacon, pork and spices. This recipe calls for gelatin. You can find good quality gelatin made from grass-fed cows online (see sources). Chop the pork into 1-inch cubes and coarsely chop the bacon. Chill in the refrigerator for 20-30 minutes. Meanwhile, sprinkle the gelatin over the cold water or stock and let stand in the refrigerator until needed. When the meat is thoroughly chilled, place the garlic, rosemary, and salt in a food processor and pulse until the garlic is very finely chopped. With the motor running, add the meat and fats to the bowl a few pieces at a time. (Work quickly to keep your processor from overheating.) Grind until they are a smooth paste, then pour in the gelatin mixture and process until the mixture is once again smooth. Shape the paste into a 3-4″ diameter log and place at one end of the cheesecloth. Lay extra sprigs of rosemary all around the log, if desired. Roll the cheesecloth up as tightly as possible and tie the ends with kitchen twine. Place in the refrigerator for at least 30 minutes and up to 24 hours. When you’re ready to cook the pork log, preheat the oven to 375 F. Place the meat in a baking pan and create a bain marie by pouring in boiling water to at least halfway submerge the meat. Bake for approximately 1 hour and 15 minutes (give or take 15 minutes depending on the thickness of the log), until the meat registers 155 F on a meat thermometer. Cool completely, then using a very sharp knife, shave it into very thin slices. How much garlic do you use? It’s not listed in the ingredients, but it is in the directions. When creating a bain marie – Do you put the boiling water in with the “roast” OR do you place the pan containing the roast in a larger pan that you fill with boiling water ? I place the meat right in the water. I find that it’s just plain easier and it keeps the meat moist. A bain-marie is when you put the dish containing the food in another pan that is filled halfway with simmering water. When the meat itself is partially submerged in a liquid, that’s a braise. Ditto to above questions, and also how much water or stock do you use with the gelatin? You can add up to 10% of the weight of the meat in liquid, so in this case it’s 1/3 cup water or chicken stock. To keep the fat in the recipe as solid as possible, you’ll want to use ice cold water. If you’re using chicken stock, use it as cold as possible while still being liquid (so you can add the gelatin), or if it’s a very gelatinous stock, you can just scoop it in as is and skip the added gelatin altogether. Neither the garlic nor the cold water are listed with the ingredients but both are mentioned in the instructions. How much of each do you use? How much water/stock for sprinkling the gelatin in? Recipe looks wonderful, but how much water and gelatin do you use? How much stock or water to hydrate the gelatin? This looks like a great recipe to try, if it was complete. I’ll second the above questions: what amount of garlic? and what amount of cold water for blooming the gelatin? Neither is listed among the ingredients. Bobbie, re: the bain-marie, I’m *guessing* the water gets added directly to the pan with the meat roll in it, since the instructions are to “at least halfway submerge the meat” ? Do you cook the loaf wrapped in the cheesecloth or remove it first? Wrap it in the cheesecloth and cook it while still wrapped. You’ll want to place the meat right in the water in the baking pan. So then you remove the cheesecloth after it’s cooked? Yes, that is correct. You remove the cheesecloth AFTER it’s cooked. Do you have any suggestions to use instead of rosemary? We have some who get headaches after eating rosemary and the rest of us don’t care for it much. Would basil or parsley work? Y’know, you could actually just skip the herbs altogether – it’s still quite flavorful. If you want to infuse it with some sort of herby flavor, I’d suggest thyme, sage, oregano, or something hardy. Basil and parsley may not stand up to the rigors of prolonged heating very well. Could you do this with chicken meat? This looks wonderful! Absolutely – it works beautifully! In fact, I do that to make homemade chicken nuggets for my kiddos. This. Looks. Amazing. We’re just getting to know the families in our local homeschool group so I’m trying not to scare them with our liver-infused, chicken feet revering diet. This will do the trick for our weekly picnics! Has anyone done this with venison or elk? I’m going to try this with beef. I have no access to pastured pork, but we have our own grasser cattle – one in the freezer right now. Yeah! Same as above though, how much H2O? I prefer to use beef also. So, what fat to use in place of the bacon? I’d love to see answers to the above questions, too.. would like to try this. One important point that will get you closer to success – Be sure to keep your meat VERY COLD at all times. This means keeping the meat over ice at all times when you’re not handling it (most easily accomplished by filling a large bowl 2/3 with ice, adding some water, then placing a metal bowl on top for the meat). The proteins in pork, called myosin, coagulate at room temperature and, if this happens, your final product can have a less-than-desirable texture. I saw no mention of grass fed meat but stopped reading when I saw “extra cubes of fat”. This is a health disaster waiting to happen. Gary, please read more about real meat and the need our bodies have for real fat. I recommend you start reading at the Weston A. Price Foundation website. I’m with Gary on this, though home-made probably is better than the grocery’s version. Olive oil etc is “real fat.” If a fat is a solid at room temperatures, it’s going to clog our arteries. When people didn’t live as long, they died of other things before this was as much of an issue. This sounds wonderful to try. 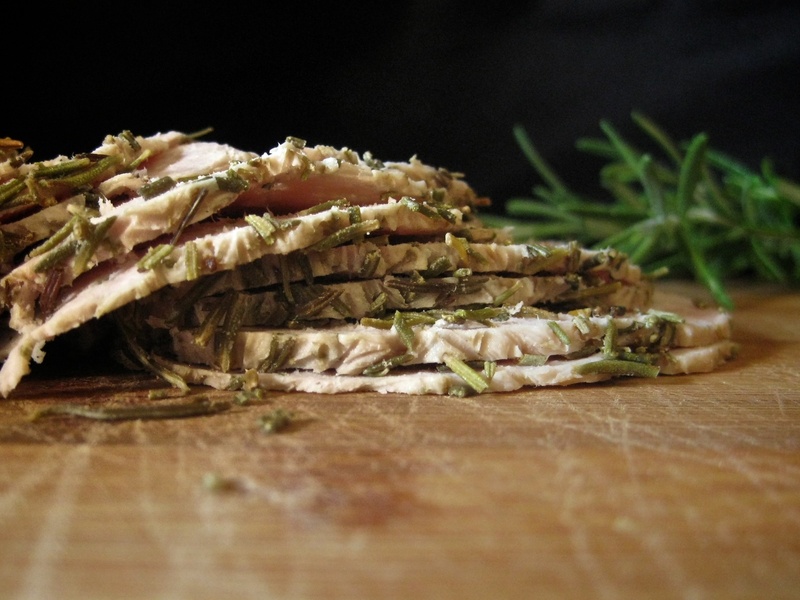 I have been looking for ways to make good lunch meat instead of buying it at the store. I wish you would make a short video of you making it. i would love to see it done first before I try. Please!!! oh my gosh, where have you been all my nourishing life?! This is just what I need! Thanks!! It says to sprinkle the gelatin over the water or broth- but that’s not listed with the ingredients- how much water or broth is used? Thank you for the recipe, I’m excited to give it a try! We don’t eat pork but would really like to try the recipe, especially since my deprived teenaged son has been pining for some (nitrate-filled) cold cuts for lunches. Would chicken work at all? What would you recommend for the part of the chicken to be used – dark meat, white meat, mix of both or ground chicken? Thanks for reply. Chicken would absolutely work – quite well, actually. My personal preference would be for a mix of white meat and dark meat, but use whatever you have – it will work either way. N.B. Using all breast meat might result in a slightly drier loaf, so in that case you’d want to add more bacon or another source of solid fat. I make my own charcuterie from our organic pork and that can keep for weeks, if not months without using additives. You should be able to find organic sausage (links) casings from a USA supplier and then the method of preserving is down to the quantity of salt you use. If you hang your chorizo up with a commercially produced one in a cool dry place, your own will soon take on the characteristic white bloom of the commercial one, and it will smell and taste just as good if not better. Plus it keeps for as long as you can keep your hands off it! Approximately how much does this recipe make (weight)? Can I use ground (pastured) pork for this? Or would that be too fatty? Yes, absolutely use ground pork for this. It would work very well. You want some fat in the mix, so that would be an excellent choice. Obviously it must go without saying you should find bacon that is nitrate free. 99% of bacon sold in supermarkets is saturated with preservatives including sodium nitrate. Otherwise, save the effort and just buy the deli meats. Here’s an interesting article from the WAPF website, written by Dr. Kaayla Daniel, that contradicts this commonly held belief. Very controversial for me and I still try to limit the amount of nitrate-cured meats that we eat but it causes my mind to stretch. Awesome idea! I love this, and never would’ve thought of it. Yum, thanks for this recipe. We usually buy organic lunch meat and it’s very expensive and doesn’t always taste as good as it should. 1/2 lb bacon !!! Nitrates have been the subject of controversy as a potential cancer-causing agent. Is the bacon necessary for this recipe?!?! Many stores carry nitrate and nitrite free bacon now. I like Applegate farms brand because it also promises the animals are treated humanely. Of course, it would be best to buy naturally cured bacon from a local farm if it’s available. What I need now is a recipe for liverwurst, if you haven’t posted one yet. As a kid I used to eat “Mother Goose” liverwurst at my grandma’s house all the time and I LOVED it but of course it’s full of junk. If I could make it myself, healthy, it would just be so awesome because the liver would be so healthy for me right now. I do have easy access to pastured liver so that isn’t the problem! Any ideas? Well, every time I make this Beef Liver Pate with Red Wine and Herbs, I’m told it tastes just like liverwurst. (I think so too.) And while I haven’t made it myself, this Sage and Chicken Liver Pate also looks quite promising to have that je ne sais quoi liverwurst flavor. I purposely made the beef pate weekly while I was pregnant, and between myself and my toddler who also loves liverwurst, we would finish off the whole batch within 2-3 days. my grandchildren love liverwurst and after making your liver pate the other day, i’ll be able to give this to them as well. It was great. I dividied it up into 3 servings and we guests coming to orrow night so it will be on the appetizer plate. I’m making the ‘lunch meat’ out of pastured chicken this week, i’ll probably use my fresh lard for the fat, I figure i’ll freeze it in little bits to get it cold enough. Perfect! I am trying to plan a pregnancy and am trying very hard to figure out ho to get some liver into my diet. I will definitely try this recipe….Thanks! This is brilliant. I can’t do packaged meats anymore due to a recent corn intolerance. Plus, since that I have no desire to feed my kids the junk that’s in those packages! Thanks so much. ^corn intolerance. I have a dextrose intolerance. Nasty reaction, so buying prepared foods means reading every label for maltodextrin, dextrose or similar sister names for corn sugars. The allergist found corn itself isn’t the issue, even though corn and corn products cause reactions, most likely what additives are present during the growing of the corn. Today I am trying to figure a way to turn ground turkey into a luncheon meat, as most lunch meats, pepperette, and sausages have dextrose. Here’s to making our own goods and eliminating these nasty additives! Your timing is perfect! I was doing research a few days ago to develop my own recipe since I can’t find organic lunch meat without carrageenan. I don’t eat pork, but I will try your method with a different protein and see which one works better. Well…..it came out with a texture similar to very firm meatloaf and the taste is in the neighborhood of Vienna sausage. It’s very good. My hubby is a little unsure yet, but my 14 yo son loved it. I tweaked mine just a little. They didn’t have a package of plain rosemary at my store, so I bought a poultry mix w / rosemary, sage & thyme. I added those along w /some liquid smoke and a TBL of stevia. I may try this again w/ different meats and seasonings. Thanks for the idea! I have piss poor knife skills, when I make homemade bacon it ends up thick or mixed thicknesses. For any of your readers like myself: freeze meat for 15 minutes before slicing. This makes it a little easier to handle. I do this with homemade bacon as well as beef jerky. Just got done chilling and sampling the final product and it is EXCELLENT! Great flavor, great texture, thank you very much for sharing this recipe. I’ll definitely be making this again and again! Jenny, can you use ground pork for this instead of cubing a roast then chopping in a processor or is there too much fat in ground pork? Sure would save time. Absolutely. The final texture may be a bit more “meatloaf-y,” but you can definitely use it. Enjoy! I’ve been looking forward to trying this recipe since I saw it. Today I purchased the ingredients. I used Hemplers natural uncured bacon and organic pork steaks. For the gelatin I bought in bulk at our local CoOp. I changed up the seasonings by soaking the gelatin in Drew’s shaitake ginger dressing and marinade and because I like ginger with pork I added about 5 pieces of sushi ginger with the 6 cloves of garlic. I also don’t like rosemary so I found some fresh organic savory and added some of that. Then I cracked some black pepper in there too. You’re right, you need to work very quickly because at the last minute I did overheat the food processor. The meat is in the oven now and I’ll let you know what I’m so looking forward to trying it out! Well I sliced into the finished product today and I was very impressed. A bit dry but I think possibly because I cooked it a little longer but the flavor and texture were great, although I could not taste the savory so I needed to use more or leave it out. I think the dryness could be solved by adding a sauce of your liking. What I did today was slice it thin and then quarter the slices and placed it on top of a salad and put homemade blue cheese and sour cream dressing on top. I’m not eating bread much these days so I was looking for an alternative to tuna salads, and this suits just fine. I was quite happy with the result. Then I sliced the rest and packaged it, finding I had about 10 servings and the cost for all was about $20 which is a wonderful cost for organic lunch meat with your own personality added. I just made this and it’s yummy! I was wondering how long it will keep for in the fridge or whether I should freeze it. It should keep for 1-2 weeks in the refrigerator. I’ve never tried freezing it, so I’m not sure whether the texture would remain the same or not – if you try it, please let us know! Can I use the meat grinder attachment for my Kitchenaid to grind the meat? I gave away my food processor! hi, I had a go at this and I’m pleased with the result but I think all the gelatine leached out into the water. At the end I was left with a very gelatinous “stock”. I’m planning to try again, but would probably use loaf tins.Or kitchen foil to make the roll so that the gelatine stays with the meat. Thank you, thank you, THANK YOU!!! My kiddos are such great sports about eating homemade, real food when all their classmates are pulling out their store bought faux food at the lunch table. They agree that the food we eat tastes a million times better than the overly processed crap that comes in all those pretty packages. But this has been their one area of resistance. I absolutely refuse to buy meat from anyone other than the local organic and certified ethically produced items available through my food cooperative, but none of the producers offer lunch meat, which my kiddos adore. Ive been looking for recipes forever, but most recipes either call for unacceptable ingredients or are not really suitable for a home cook. My kiddos will be over the moon to find lunch meat sandwiches in their lunch boxes! Thank you for making me awesome mom again! Can I make this with ground pasture raised pork? We ended up with a lot of ground pork from the last pig we had butchered and im looking for ways to use it up! This looks amazing. Have you ever tried using it to sneak in some organ meats? I just discovered this post. Is this doable with other types of meats like uncured ham, chicken, and beef? How does this last for up to 2 weeks in the refrigerator if there are no preservatives? I would have thought 5 days tops? I will have to try this one. Any good recipes for liver wurst, or lunch meats made from organ meat? I’d be interested in these. Thanks so much for posting this recipe. I was so excited about it and made it for my husband (he loves lunch meat sandwiches). The end texture is spongy and kind of off-putting. Maybe my meat warmed up too much as one poster mentions avoiding? So disappointing. Thank you for this lovely recipe. I want to make it for my boys lunches when they go to work.